The value of endowments to a University cannot be overemphasized. Endowments provide a continual source of funds for scholarships, academic enrichment, athletic programs, and campus needs. We are pleased to announce that fifteen new endowments were established in 2015, eight of which were also funded to award level this year. In addition to our new endowments established, we have twelve previously established endowments funded to award level this year. Charolette Baine Scholarship-Established by James E. and Charlotte Baine (’94) to assist a deserving and needy student getting a graduate degree in counseling. Imogene M. and Richard P. Clark (’48) Memorial Scholarship-Funds provided by Richard P. Clark, II and Roland L. Clark in memory of their parents. Mulerider Book Fund-Established by alumni and friends. Vernon C. and Nora T. Porter Scholarship-Established by a gift from the Vernon Porter Living Trust for a scholarship to assist students whose families are associated with the Church of Christ. Travis and Lauretta Buchanan Scholarship-Established by Travis (’78) and Lauretta (’78) Buchanan to provide a scholarship for a student in the College of Education. Dr. Rudy and Sharon Miller Eichenberger-Established by Dr. Rudy and Mrs. Sharon Eichenberger to benefit Magale Library. Paul Jack English Scholarship-Established by Mrs. Olga English in memory of Paul Jack English. Mac Woodward Scholarship-Established by Dr. and Mrs. Larry Embree for a scholarship in memory of Dr. Embree’s esteemed longtime classmate and cherished lifelong friend, McCatherine Bruce “Mac” Woodward, whose character was admirable, demeanor exemplary, and accomplishments impressive. His life will serve as an inspiration and his scholarship as an opportunity for those who strive to make the world a better place. Jeff and Marcia Jester Athletic Scholarship-Established by Jeff (’84) and Marcia (’80) Jester to repay all the blessings that they have received from his association with SAU. Frank Merritt and Kelvin and Cissy Wyrick Scholarship-Established by the Estate of Frank Merritt. College of Education Professorship-Established by alumni and friends of the College of Education. J. David Ashby Finance Scholarship-Established by Mustard Seed Wealth Management in honor of J. David Ashby (’77) for a Junior or Senior Finance major who plans a career in the financial planning profession. Gary and Gaywyn Golden Family Scholarship-Established by Gary (’72) and Gaywyn (’72) Golden to provide a scholarship for a student in the Agriculture Department. In Memory of James and Katharine Lawrence-Scholarship established by Richard (’72) and Pam Murphy in memory of her parents. Dr. Gayle White College of Business Student Travel-Established by Richard and Gayle (’63) White to benefit student travel in the College of Business. Bill and Barbara Scurlock Athletic Endowment-Established by Dr. and Mrs. W. R. Scurlock to benefit Athletics. H.D.”Happy” and Linda Shinn Grace Athletic Endowment-Established by H.D. “Happy” (’68) and Linda Grace (’67) to benefit Athletics. Alice Blanchard Thomas Scholarship (’82)-Established by Louis and Martha Blanchard in honor of their daughter to benefit an Accounting major. Gail Blanchard Michels Scholarship (’74)-Established by Louis and Martha Blanchard in honor of their daughter to benefit a Business Marketing major. 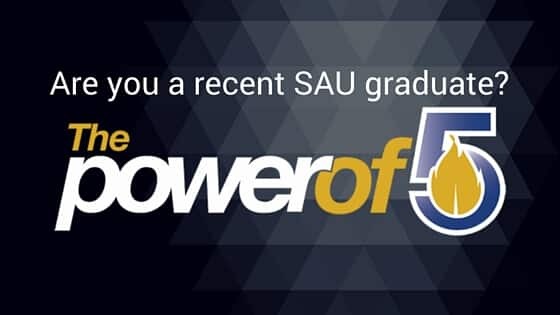 SAU Alumni Association Scholarship-Established by SAU Alumni Association to benefit an incoming freshmen who is a son or daughter of a former student at Southern Arkansas University. MHS 50 Plus Reunion Scholarship-Established by the MHS Fifties Plus to benefit a student from Magnolia High School. MHS Class of 1965 Scholarship-Established by the MHS Class of 1965 in honor of their classmates that have passed to benefit a student from Columbia County. Dr. Rudy J. Eichenberger-Established by Dr. Rudy Eichenberger to benefit a junior or senior student in the College of Science and Engineering. Adcox Family Endowment-Established by the Adcox family to benefit the Mulerider Activity Center. Dr. Lionel Barton-Established by Dr. Lionel Barton (’58) as a scholarship endowment to benefit a student interested in poultry. Joe and Angela Pieratt Scholarship-Established by Joe (’92) and Angela (’92) Pieratt to benefit a student in the College of Business. Each completed endowment will be commemorated with a plaque on the Endowment Honor Wall in the Reynolds Center. In the spring, the Foundation will host an Honors Society Dinner to express its gratitude from the generosity shown to Southern Arkansas University Foundation. Below are a few of the pictures from our 2015 Honors Society Dinner celebrating our 2014 Donors. For information about how you can become a member of the Honor Society, call the SAU Foundation office at (870) 235-4078.